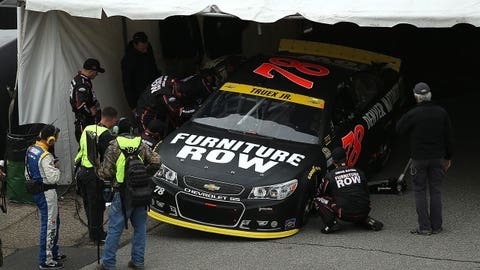 Furniture Row Racing crew members work on Martin Truex Jr.'s No. 78 Chevrolet prior to Sunday's race at Dover. NASCAR officials did not like how the right rear quarter panel looked on the grid and sent the car back through the technical inspection process. NASCAR announced Wednesday afternoon that Furniture Row Racing crew chief Cole Pearn has been placed on probation through Dec. 31 for an infraction that occurred prior to Sunday’s Sprint Cup Series race at Dover International Speedway. The team was hit with a P2 level penalty (Sections 12.1; 20.4b; 20.4.2a; 12.5.3.2.2). While the No. 78 Chevrolet initially passed NASCAR’s pre-race technical inspection, an official noticed the right rear quarter panel was bowed out on pit road. The car was sent back to the Sprint Cup garage in order to go through inspection an additional time. Officials made the team correct the issue and Truex was sent to the rear of the field for the start of the AAA 400. At the time, NASCAR indicated no additional penalties would follow. Truex was able to overcome the setback of starting 43rd on the field, finishing the day 11th and advancing to the Contender Round of the Chase for the Sprint Cup.